If necessary, fold the backrest of the rear bench seat forwards . Remove items of luggage so that you can reach the tailgate from the inside. Look for the slot for manual unlocking in the lower part of the tailgate . Insert the opened key bit horizontally into the slot. 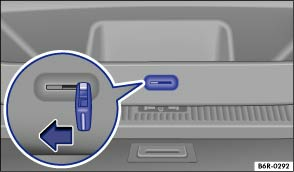 Push the vehicle key in the direction of the arrow and push the tailgate out until it opens. At the same time, pull the vehicle key out.